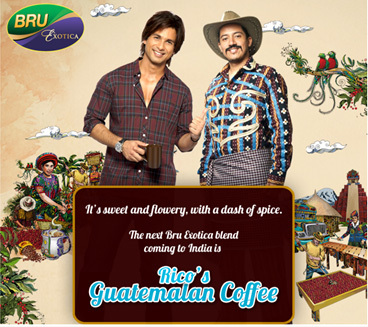 Bru Exotica launched its new flavour, Guatemalan Coffee, through a Facebook campaign last week. The campaign kick-started in June when fans on Bru India's Facebook Page were given coffee flavour options to choose from, through a novel application. Three unique options (Sumatran, Ethiopian, Guatemalan flavours) were put together with local characters that introduced them. Every character’s page on the application shared images from their country, links to more information and introductory jingles. Fans could show support for the coffee flavour of their choice. I have an issue with the quality of some parts of the execution. The location snapshots used in the pre-launch application were pixelated and the intro jingles were sub-optimal. Don’t get me wrong. I love the idea and the campaign itself is really well thought through. Pity, but it seems like low budgets got in the way! As a user, I’d rather see three high quality images and one well produced video that I can share along than a host of average content. The brand also created buzz on Facebook in the run up to the launch. 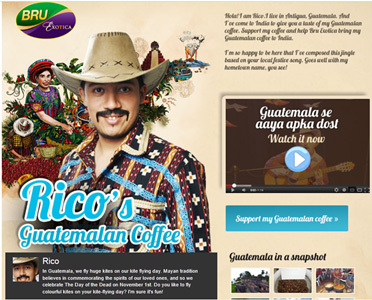 They got the Guatemalan character Rico, to take fans on a journey through his country via wall posts, where user likes would unlock different stages. The subsequent posts were related to Guatemalan highlights, way of life and must see places in the country. A couple of days before the launch, Bru created an event on Facebook for fans to preview the new TV commercial featuring Shahid Kapoor. The coffee brand from Hindustan Unilever anyways exists only on Facebook (there is no other brand site that I am aware of for Bru) and the complete campaign was planned, right from inception to launch, on the social platform leveraging its features to the hilt. Youtube’s Masthead ad unit was used on 6th September to promote the Facebook page and the commercial.